We don't meet standards, we surpass them. What does it mean for your pet's food? Free Shipping on every order of $50 or more! 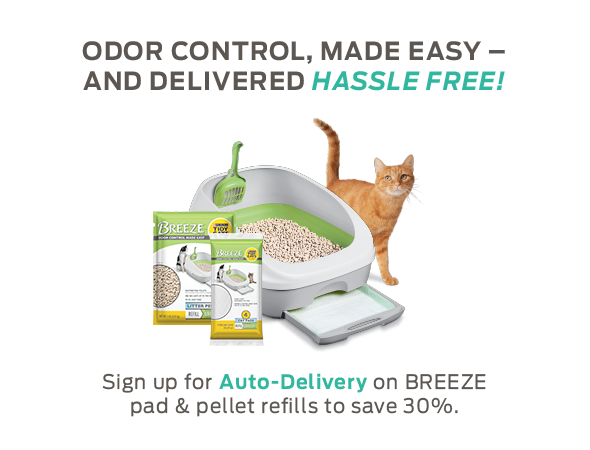 BREEZE® Litter System is an all-in-one system that separates waste to make odor control easy. Specially designed, cat-friendly litter pellets that are anti-tracking and 99.9% dust free allow liquids to pass through to the absorbent cat pad below, while helping dehydrate solid waste that remains on top for quick, easy scooping and outstanding odor control. Urine is quickly absorbed by the disposable, odor-controlling cat pad that sits in the tray below. The hinged hood provides easy access for cleaning and refilling. Each system comes with litter box, custom scoop and enough pads and pellets for one cat for one month. BREEZE Original Sidewall Litter System also available. Simple Setup & Maintenance: 1. Snap the sidewall onto the grated base. 2. Place one cat pad (soft side up) in the BREEZE Litter System drawer and slide into the base. 3. Fill the top portion of the box with one 3.5-lb package of litter pellets. 4. Scoop out solid waste and dispose of daily (pellets do not clump). 5. Add more pellets as needed. We recommend that you replace the pellets completely once a month. 6. Slide drawer out to replace disposable pad. Drawer can be rotated 180 degrees, without touching the pad, to extend pad life. Transitioning Your Cat: For best results, please follow all steps: 1. Place a Breeze® cat pad, soft side up, in the drawer. Slide the drawer into the base. Fill the top portion of the box with one 3.5lb package of Breeze® litter pellets. 2. Put stool and/or urine clumps from your previous litter box onto the litter pellets in the Breeze® litter box. This helps your cat understand that Breeze is her new litter box. 3. Place the Breeze litter box next to your previous litter box, and let your cat have access to both boxes. Please stop cleaning your previous litter box. 4. After 2-3 days, remove your previous litter box. Animal Behaviorists recommend multiple cat households have multiple litter boxes: one system per cat, plus one additional system. Note: We want to remind those with suppressed immune systems and pregnant women that a parasite sometimes found in cat feces can cause toxoplasmosis. Please wash hands thoroughly after handling used cat litter. Encouraging your cat to use an indoor litter box, or properly disposing of outdoor cat feces, is beneficial to overall water quality. Please do not flush cat litter in toilets or dispose of it outdoors in gutters or storm drains. Used litter is not recommended for garden use. Store in a dry place.